There is many times that i saw similar public api from ivy then i could not distinguish between them, i believe some of my co-workers has the same feeling. In this post i need your help to make it more clear. Does they return the same result? Configuration data are in the system database stored data, like Applications, Cases, Tasks, Users, etc. Runtime data are not persistent and exists only at runtime, like the requests or sessions. All API calls on the Ivy-Bean returns either configuration or runtime data related to the current execution context. E.g. the current executing request or the task of the current execution process. Ivy.wf() Returns the IWorkflowContext of the current execution Application. Ivy.wfCase().getApplication().getProcessModels() returns all Process Models of the Application the current Case belongs to. As well as the call Ivy.wfTask().getApplication().getProcessModels(). Because a task and a case belongs to the same pmv, pm and application. Ivy.request().getProcessModel().getReleasedProcessModelVersion(): The current IProcessModelVersionRequestbelongs to a Process Model, this process Model has one single ‘released’ Process Model Version. This is returned here and this has not to be the same as ivy.request.getProcessModelVersion(), because a Case/Task lives always in the PMV the Case was started in. Etc. Hope this information will help. Don't hesitate to ask further question as comment. I will update the answer. Yes, i have another question, as you said "Case/Task lives always in the PMV the Case was started in". so for example i have a project A then i deploy it to PMV 1, i create some cases/tasks on this version. Then i change implementation of Project A (i keep all task elements, just implement some new java class, new api, new logic). Now i deploy project A to PMV 2 (new version) and make it Active and Released. Question: What happen if i start cases/task of PMV1 from released PMV (version 2)? which classes will be loaded? I have some small test and i saw the old task will run on released PMV (PMV2), is it correct? If it should be possible, I would classify this as an bug. Of course, I would be happy for the test projecte to verify the behaviour. I just realize that somehow is a problem of deployment wizard tool, when i use it to deploy, it always deploy latest version on PMV1 (even i select PMV2 as the target). that's why i see the new logic on old cases. So when i try with Deploy button on each PMV, it work as you said. I'm using version 6.3.0, don't know whether this is an issue or not. In my app, we store the task in two places, when creating task, for the main data model, we store in our persistence (BusinessReposiroty) and we take out the id from there then store to Ivy Task. Q1: When user open task, we have that id then load business data from Repository. this case will work.i guess it will load with classLoader of pmv which the task belong to. is it correct? 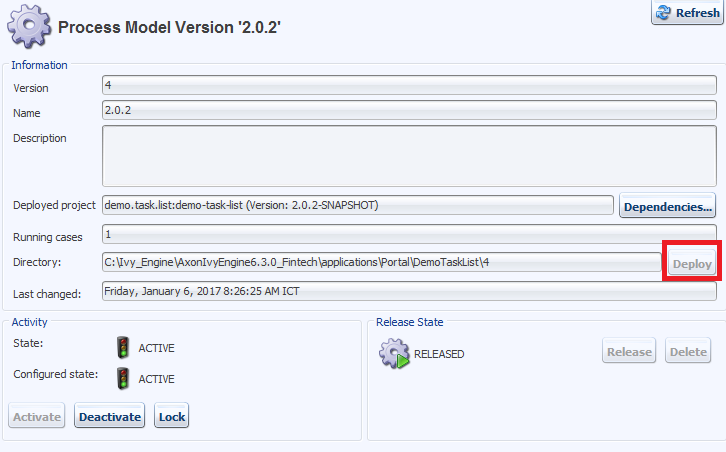 Q2: for the case we have that id then load directly data model from repo(not start from task), it could be an issue? any way to avoid it?